Love-a-School campaign is one of the fundraising events by the Adopt-a-School Foundation which was created to be a positive force in changing the future of education in Southern Africa. Through a holistic, inclusive model called Whole School Development, the Foundation addresses the academic, infrastructural, social and security environments in adopted schools, to ensure that the schools are conducive to teaching and learning. Through this holistic approach, the Foundation is able to address most obstacles that stand in the way of providing quality education. Schools supported by the Foundation are some of the least resourced and marginalised schools in the country, but as long as there is a passion and a commitment to education, together with partners, we are able to bridge many of these gaps. The aim of this fundraising campaign is to create awareness around the work of the Foundation and to also cultivate a love of education and giving back to the communities we operate in across South Africa. 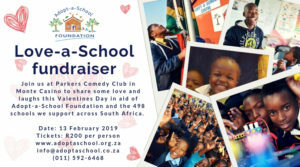 We look forward to connecting and hosting you at the Parker’s Club Comedy on the 13th February 2019 for our Love-a-School Fundraiser initiative.